Before we get into the latest developments, it’s probably worthwhile to retread some of the old ground here on the burgeoning legal fight over Louisiana Attorney General Jeff Landry’s refusal to approve a contract extension for Larry Bankston to serve as the executive counsel for the Louisiana State Licensing Board for Contractors. All of this might seem very much in the weeds to the casual reader, but trust us – it’s not boring. It’s actually about as Louisiana politics as it gets, and if you’re looking for an old-fashioned glorious mess complete with crooks, clowns and outrage this will certainly do. Bankston is a former Democrat state senator from Baton Rouge who got busted by the FBI several years ago for a crooked arrangement he made with a truck stop video poker operator who wanted him to bring a bill that would create more favorable conditions for the video poker people. The operator bribed Bankston, a federal court concluded, by “renting” a condominium on the Alabama Gulf Coast that the senator had owned despite no evidence he actually used the property. That arrangement cost Bankston some 41 months in a federal penitentiary, plus the loss of his law license. But Bankston got himself reinstated to the Louisiana bar somehow (not really; connections will get you anything in this state), and before long he’d made a comeback from status as a federal inmate to representing a number of Louisiana’s boards and commissions as their attorney – a couple of them being the Amite River Basin Commission and the Louisiana Auctioneers’ Board. And after John Bel Edwards won election Bankston – who has donated some $4,850 to Edwards’ campaigns since 2013 – got himself appointed as the executive counsel to the contractors’ licensing board. Most of these appointments are pretty mundane, but the one with the contractors is a little juicier because a contractor’s license can be awfully valuable and particularly in Louisiana it can really be a big deal given the high frequency of things like hurricanes and floods and the crush of construction they necessitate. Back to that in a minute. 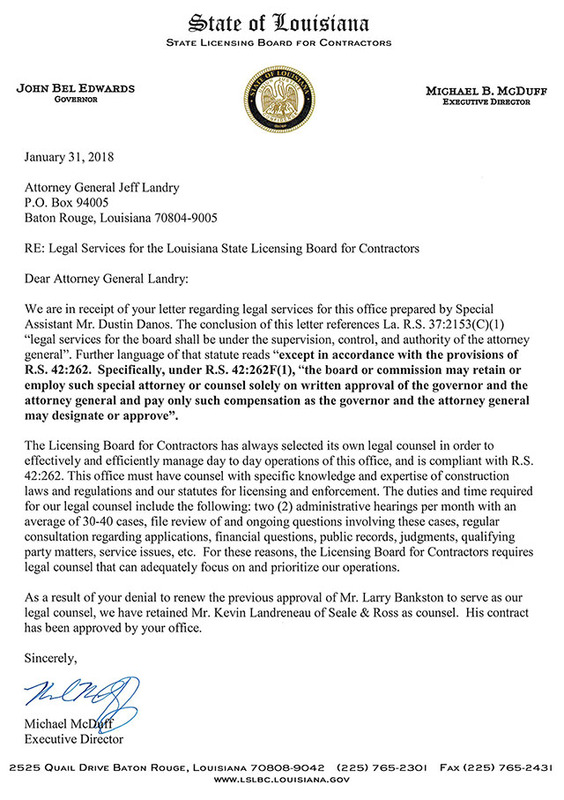 Bankston’s initial, interim contract with the contractor’s board was approved in January of 2016, because Landry was taking over as the Attorney General, didn’t have all of his own people in place and wasn’t going to hold up all of the state’s legal work while he was getting his own operation up and running. But that summer Landry revisited the situation and denied an approval of the longer-term contract Bankston sought on the basis that hey, maybe it’s not a good idea to have the lawyer for the contractor’s licensing board be a convicted bribe-taker given that the board’s decisions to award licenses could be influenced by the legal opinions of the executive counsel and what if he’s giving advice based on bribes and conflicts of interest? Landry raised this objection, and for his trouble he essentially got shouted down. Edwards attacked him for objecting to the contract, the executive director of the contractor’s licensing board Michael McDuff was up in arms and the Baton Rouge Advocate reported the kerfuffle as a petty political beef between Landry and Edwards motivated by Landry’s impending 2019 gubernatorial challenge to Edwards. 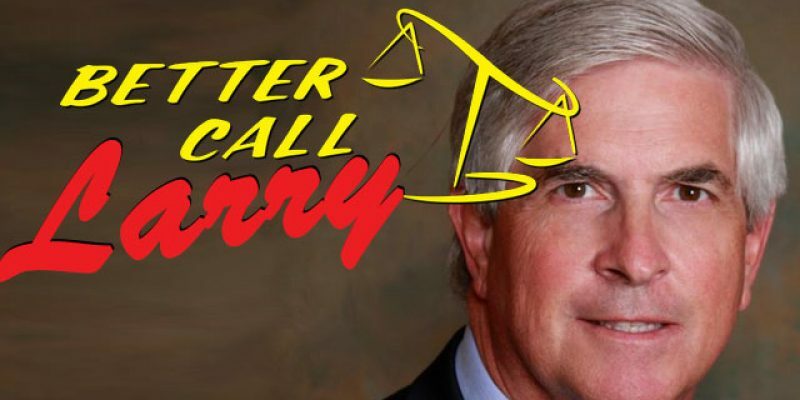 Lost in all the noise was the fact that Louisiana was going to have a guy who went to federal prison for taking bribes acting as the lawyer for a state board which decides who can work on construction projects. And in a supreme bit of cosmic irony, almost immediately after the controversy died down and Bankston settled in as the attorney for the licensing board, some 30 inches of rain fell on South Louisiana in the space of three days in mid-August of 2016 and over 100,000 homes in the Baton Rouge area alone went under water. All of a sudden the presence of a Louisiana contractor’s license was a very big deal, because billions of dollars in repairs were now in order with nowhere near enough contractors to complete that work in the near term. So now it really did matter that the licensing board for contractors would be run with some degree of integrity. And predictably, a $300 million flood recovery contract the state was letting in early 2017 was blown up because Bankston said the company which supplied the winning bid wasn’t qualified because its license wasn’t in order – when the contract wasn’t so much a construction contract but a program management contract. It turned out Bankston’s son worked for one of the other bidders, which together with his own history gave off a fairly pungent smell, which wafted all the way up to Washington where the funding for the contract was to originate. That led to Edwards being taken to the woodshed by Rep. Mark Meadows in a congressional hearing over Bankston’s actions. The original winner of the bid won the contract on a re-bid, but several weeks had gone by during which people affected by the flood had to do without any flood recovery aid – plus, there was a major black eye for the state in the bargain. Bankston’s contract with the licensing board actually expired on July 31 of last year, and the board just let it slide for a while before presenting an amendment to it to Landry’s office. Presumably, that was done because had Bankston’s contract been sent to Landry last summer when the flood recovery debacle was still a hot item the political fallout and general barroom brawling that would have ensued might have looked like something from the climactic scene in Blazing Saddles. But if the board was hoping things would blow over enough to slide Bankston back in for another year without Landry’s objections, they were sorely disappointed. Landry’s response wasn’t no, it was Hell No. And that’s when Bankston sued Landry seeking a writ of mandamus in an attempt to force him to approve an amendment to the contract extending its end date for another year. Now you’re more or less up to speed. But there’s news on this case today which indicates how much fun all this will be. It’s a reasonable assumption that this is going to drive Bankston crazy, but it’s also going to drive Edwards up the wall as well. Landry’s office dropped a bunch of exceptions (dialiatory, no cause of action, etc.) literally 20 minutes before this morning’s 9 am hearing. Mary Olive Pierson (Bankston’s attorney) said she got it only 10 minutes before the hearing and that it is three inches thick. Fields wanted an explanation as to why it was filed so late. AG‘s Office responded, “because we were served with this lawsuit only two days ago and we were up until 10 pm last night drafting those exceptions. AG’s Office then cited Code of Civil Procedure mandating that exceptions had to be heard before injunction. Fields had no choice but to reschedule for 2/9/18 at 9 am. Gave deadline of 2/6 at close of business for opposition to exceptions and 2/8 at noon for any reply by AG’s Office. It was obvious Pierson and Bankston (yes, he was there and saw me as only myself and Advocate reporter Joe Gyan were there) were not happy. So now we’ve got this case set for a hearing next Friday, at which time it’s likely going to become highly contentious. We’ll pass along updates as we have them. We got a kick out of the last paragraph in particular. 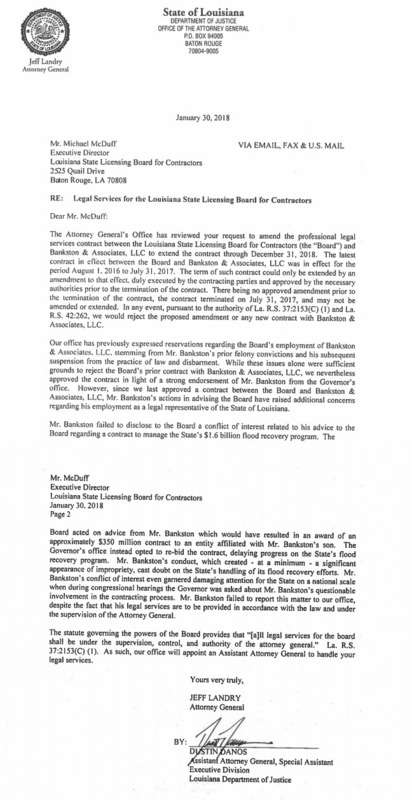 It sent us to inquiries among our friends in the legal profession, because it would sure seem like if the board went out and hired Landreneau that would make Bankston’s case moot, no? As we understand it the basis of the suit, or at least most of it, was it sought a writ of mandamus against Landry to force the AG to sign off on his contract to represent the licensing board. Well, if the board hired somebody else then it seems like Bankston’s new problem is with his old employer and not Landry – and what’s more, the court can’t give him injunctive relief against Landry without also ordering the licensing board to rehire him. So much for the suit, it would seem. But at least it’ll go on until next Friday at which point we’ve got to figure Fields will dismiss it. What else can he do?